Once the decision was made to go natural, I submerged myself in the world of natural hair care. One of the first articles I came across stressed the importance of ‘knowing your hair type’. I scanned the chart and tried to identify one of strand types that closely resembled my own. Feeling confused and unsure, I settled on 3C. After a few washes and seeing images of 3C hair, my hair didn’t look anything like that. I went back to the chart and then concluded that my hair fell somewhere between 4A and 4B type. However, the methods recommend for 4A and 4B hair types did not work for my hair, the products were too heavy and the washes too infrequent. Now, 12 months later I still don’t really know what ‘type’ of hair I have. All I know is it’s MY type. My hair can be dry, springy, full, soft, coarse and everything in between. Don’t get caught up in labels. Get to know YOUR hair and find the products and regimen that are best for you. Don’t get me wrong. I love YouTube and have learned so many techniques from my favorite natural hair gurus. Still, it can lead to hair envy, product obsession and hours spent staring at your screen. We can get lost in all the glamor of video editing and paid product reviews that we end up with a draw full of products that a) we don’t need, b) don’t work for our hair, and c) perhaps not even in our budget. Do your research and take into account what the experts are saying, but you have to eventually learn what your hair likes. What works for Naptural85 and KimmayTube may not work for you, and that’s OK. Don’t form some type of jealousy for their hair and in turn begin hating your own. Embrace the crown of hair God bless you with and love what is uniquely you. I started this blog obviously to document my hair journey, but I was also looking for a creative outlet that I could enjoy. Not everyone wants to start a blog or a YouTube channel, but it is still important to document your growth and progress in some way. Whether it’s monthly pictures or dated length checks, keeping track of where you started can help you stay the course. 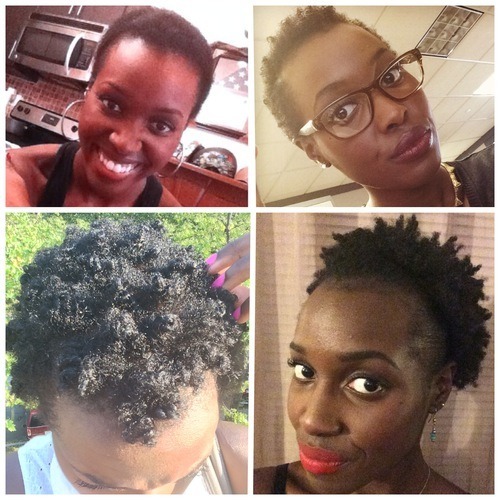 Those days when you’re feeling not so pretty (and they will occur) or think your hair is no longer growing, you can look back at your TWA phase and smile. Beauty has so many definitions and you’re just one of them. Continue to love yourself and you will see your true beauty. 2014 has been such a great year. I’ve grown professionally, personally, spiritually, and in so many other ways. Going natural was just another way to becoming closer to the real me and the person I’m meant to be.